Host your next golf tournament at our first-class facility to make lasting memories. We offer one of the most value-packed memberships in the Atlanta area - click to learn more! The Trophy Club of Atlanta is located just north of Atlanta in Alpharetta, Georgia. Designed by DJ DeVictor and Steve Melnyk, the 18-hole golf course is skillfully routed through rolling hills and mature trees. With a 135 slope rating, Trophy Club of Atlanta provides golfers with an excellent test of their game. The award-winning par 72 golf course features four distinct tees, water on 13 holes, and tree-lined fairways that weave through strategically placed bunkers. 6,774 yards from the Championship tees provides a challenge for the average golfer. Tricky elevation changes and Champion Bermuda greens make for a perfect venue for your next golf outing. Whether it is a large or small event, our club offers an expert staff and stunning views to make lasting memories. Managed by Triumph Golf, Trophy Club of Atlanta offers a wide array of memberships to meet our golfer’s needs. We offer Full and Limited Memberships for the avid daily golfer and our well-known Players Club Membership for those who love to practice and play at a discounted price. 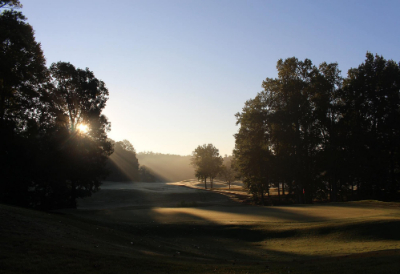 All memberships have reciprocal benefits with the Atlanta area Triumph Golf courses. (See Pro Shop for details.) We at Triumph Golf strive to meet our member’s needs.